Following their recent drop on a ratings downgrade, shares are rebounding. What: Following a seemingly never-ending string of bad news, including Moody's downgrading its debt rating on Thursday, shares in Valeant Pharmaceuticals (NYSE:BHC) bounced 10% higher earlier today. So what: As investors have increasingly grown wary of risks associated with its buy-reprice-relaunch business model, Valeant Pharmaceuticals shares have taken a drubbing in the past year. Last month, Valeant Pharmaceuticals' management surprised investors by cutting its sales and profit outlook for 2016 and revealing that debt holders could cry "default" if it misses a April 30 deadline to file its audited financials with the SEC. This week, worry that Valeant Pharmaceuticals' $1.2 billion cash stockpile was insufficient relative to its $30.9 billion in debt prompted Moody's Corporation (NYSE:MCO) Investors Service to downgrade the company's corporate family rating to B2 from B1. 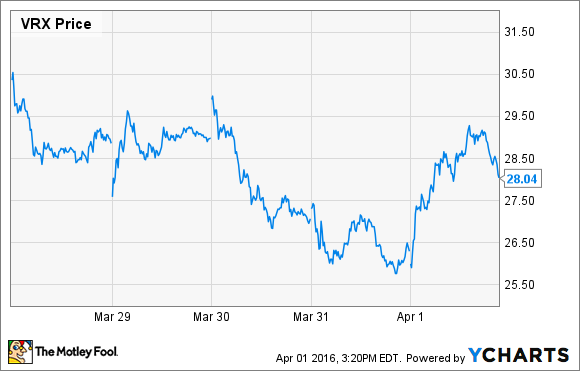 That downgrade caused Valeant's shares to slip from above $30 on Wednesday to a low of $25.75 yesterday. VRX Price data by YCharts. In addition to debt worries, Moody's also cited uncertainty in the C-suite stemming from the looming departure of Valeant's longtime CEO and operating headwinds related to a more challenging drug pricing environment as reasons for its downgrade. Now what: A downgrade by Moody's isn't all that unexpected given that the risks facing Valeant Pharmaceuticals have grown this year. Because of that, investors may be looking beyond the potential fear of default and higher interest expenses associated with the ratings change to the potential for management to get its arms around its struggles and right its ship. In March, Valeant's management forecast that its adjusted EPS (non-GAAP) would be between $9.50 and $10.50, and if it can deliver on that forecast (and assuage debt holders), then an argument could be made that Valeant's shares are cheap. That may or may not be true. A lot will depend on who Valeant Pharmaceuticals hires to replace its outgoing CEO, whether a new distribution deal with Walgreen's Boots Alliance pays off, and when it gets current on its SEC filings. Those are questions that remain unanswered, though, and therefore, investors probably shouldn't put too much emphasis on today's move.